One of a kind, The Floating Seahorse is a truly unique underwater project. Connected to the St Peterburg Island via Floating jetties, the floating seahorses will offer stunning sea and Island views and the ultimate in contemporary marine style living. Please contact us for an exclusive viewing . 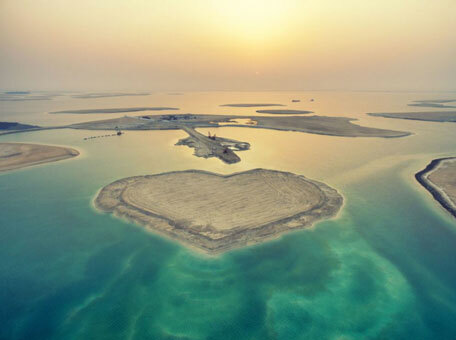 St Petersburg Island, part of The Heart of Europe (THOE) on The World islands in Dubai and designed in the shape of a heart, is now being developed as a honeymoon resort. Designed in the shape of a “love heart”, the isle draws inspiration from some world’s most sought after honeymoon hotspots in the Maldives, Bora Bora and the Caribbean. The island will have 90 'floating seahorse' villas, an underwater villa, each connected to the island though floating jetties. Set to put Dubai on the map for soon-to-be newlyweds all over the world, the exclusive island destination will offer lovebirds the perfect combination of an island retreat and a city break. Situated 20 minutes from the mainland and 6.5 kilometres from the coast of Dubai, guests will be get privacy and a 24/7 butler service. Besides, they will have access to Main Europe and Switzerland Island within THOE, which will have outdoor climate controlled technology 12 months a year. It will also have an infinity pool, shallow lagoons, tropical gardens, a pool bar and restaurant. St Petersburg Island will be a dream destination for couples and newlyweds. The five star resort will offer privacy, tranquility and first-class hospitality to ensure a memorable and once in a lifetime experience. Guests will be able to access the island with private transfers by helicopter, seaplane or boat with honeymoon bookings opening soon. The Honeymoon Hotel on Main Europe Island is set to open at the end of 2018 .